Today on the podcast, we’re Ecstatic to feature “Art of Holding On and Letting Go“, a coming of age story from an award-winning author Kristin Bartley Lenz! Art of Holding On and Letting Go is a #1 Michigan bestseller in September 2016, and it continued to be an MI bestseller in 2017. Tune in and discover what happens when Cara embarks on a year of discovery, uncovering unknown strengths, friendships, and first love. Overall, this is among the stronger episodes in the Reading With Your Kids library, if you ask us. It is refreshing, thoughtful, powerful, and certainly educational. Tune in for all the insights! Kristin Bartley Lenz is a writer and social worker from metro-Detroit who fell in love with the mountains when she moved to Georgia and California. 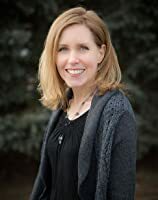 Her debut young adult novel, The Art of Holding On and Letting Go, was the 2016 Helen Sheehan YA Book Prize winner, a 2016 Junior Library Guild Selection, and an honor book for the 2017-2018 Great Lakes Great Books statewide literature program. Her fiction, essays, and articles have been published by Hunger Mountain, Great Lakes Review, The ALAN Review, Literary Mama, and Writer’s Digest. She writes freelance for Detroit-area non-profits, and manages the Society of Children’s Book Writers and Illustrators (SCBWI) Michigan Chapter blog. Learn more and connect at www.kristinbartleylenz.com. Competitive climber Cara Jenkins feels most at home high off the ground, clinging to a rock wall by the tips of her fingers. She has enjoyed a roaming life with her mountaineering parents, making the natural world her jungle gym and making the writings of Annie Dillard and Henry David Thoreau her textbooks. But when tragedy strikes on an Ecuadoran mountaintop, Cara’s nomadic lifestyle comes to an abrupt halt. Starting over at her grandparents’ home in suburban Detroit, Cara embarks on a year of discovery, uncovering unknown strengths, friendships, and first love. Cara’s journey illustrates the transformative power of nature, love, and loss, and discovering that home can be far from where you started. To order a signed copy from my local indie bookstore, The Book Beat, in Oak Park, MI, please call 248-968-1190. What does Kristin hope children will take away with them the most after they read Art of Holding On and Letting Go? A big Thank You to Kristin for talking to us and sharing her novel with our listeners!